We design spaces you can’t wait to come back to. First can I just say, I am a huge fan of gallery walls! They can add such fun character to a room and are pretty much impossible to mess up, but for some reason these babies really seem to intimidate a lot of people! So today, we are going to try to make the infamous g.a.l.l.e.r.y w.a.l.l less terrifying and more “I can totally do that!" My BEST advice for a fab gallery wall is to TAKE YOUR TIME! Its okay if you don’t find just the right pieces all in one day. My gallery wall took 4 weeks to finish because I didn’t want to throw just anything up there. I wanted it to fit who I am and the space it was going. This is SO important! The best part of a gallery wall is that it’s a reflection of YOU and your home! It’s personal. Whether its photos from your favorite memories, an old clock from your grandparents, or some crazy print you’ve always wanted in your home, a gallery wall is the perfect way to mix & match all your favorite pieces into one awesome exhibit! I know for some this “DIY” can seem a little overwhelming, but in all honesty anyone can do this! Pick out the wall you want to snazz up and measure it end-to-end. This will help give you some idea of how much wall you will need to cover. For the gallery wall in my home, I chose to use a piece of furniture as my mid-point - my couch. You can do this too, a little cheat if you will! For my wall I chose to mix metallics because I swear I will NEVER decide which I love more: gold or silver, the struggle! So I used both, because guess what - YOU CAN! I also love adding texture into your gallery wall. This is such a simple way to really make it pop. Weaved pieces, textured frames, and shallow baskets are all great ways to do this. In mine, I mixed some wood, glass, a little canvas, and of course some metal to give it that super funky flair! Once you’ve got your fave pieces it's placement time!! I am sure everyone has their own opinions on “how-to" for hanging, but between you & me, the thought of measuring EVERY piece, cutting each one out on paper, hanging said paper on the wall, and then f i n a l l y hanging the actual pieces in their place seems like total overkill. Literally WHO has time for that?! So I’m gonna share a secret with y’all. 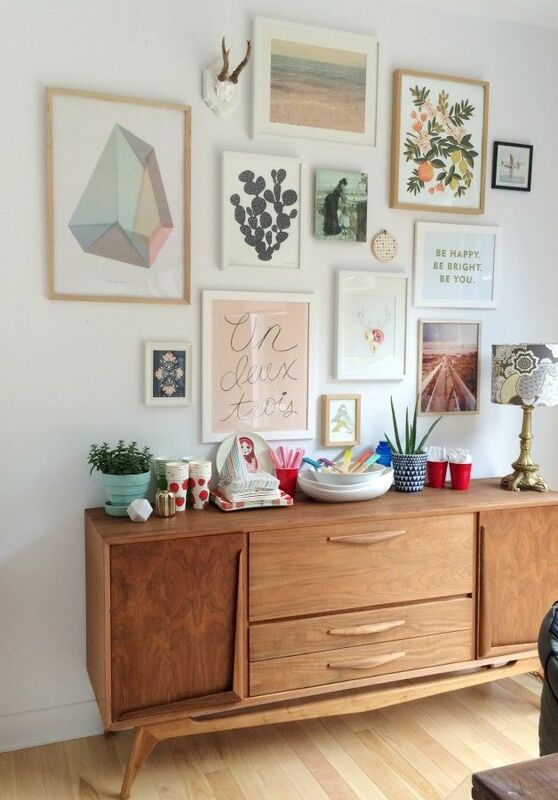 You actually DON'T have to do all that to have a killer gallery wall! There, I said it. Bring on the wolves! Here are some of my faves if you're looking for a place to start! If you're still having trouble, or you just want to share how your wall turned out, comment below or shoot us an email with your questions. We would LOVE to hear from you!